The reunion takes place over two days with more than half the guests arriving on Sunday 18 September and the rest arriving on Monday 19. The three course dinner will commence at 7.30 on the Monday evening. Below is the full text of Tony Mooney’s email sent to the 84th Entry Forum on 24 August 2016. The text will be updated to include any additions or alterations to the event. The Forum will also receive an with any alterations and amendments so that all members are kept up to date. You can view the two pages of the dinner menu here and here. We have included an open-top bus ride in the programme for Monday morning the time of which has yet to be decided. Most of our arrangements are now in place. To get the best out of your visit please read all the information below. I’ll update you with more information as it becomes available. d. These rates will be applied to your account irrespective of any higher rate you may have been quoted. N.B. If you make your reservation through an agency any agent’s fee the Hotel has to pay is chargeable to your account. Rooms are available from 3 p.m. on the day of arrival and rooms should be vacated by 10 a.m. on the day of departure. The Hotel has private parking. If you arrive before 3 p.m. please go to Reception and ask for a Parking Permit. 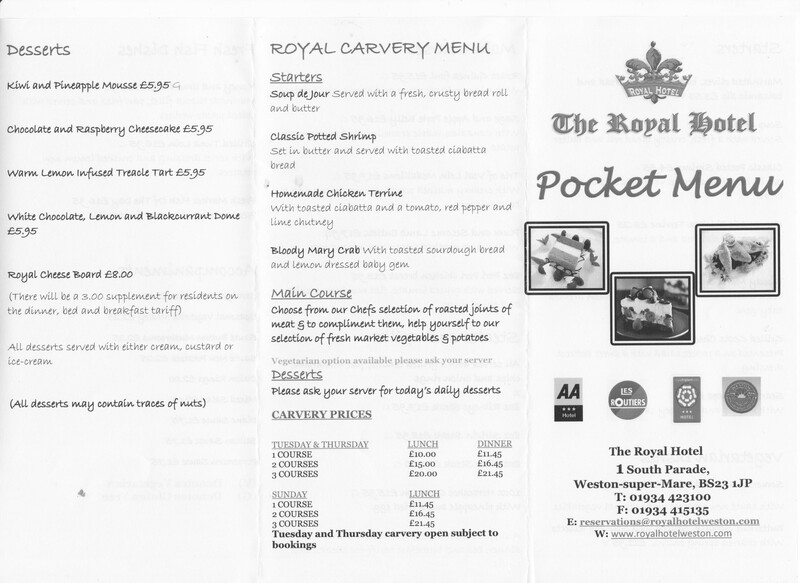 We can select the dinner from the main menu attached (two pages) with the exception of the Carvery Section. The price for the dinner is £32.50 per person to include 3 courses and house wine. 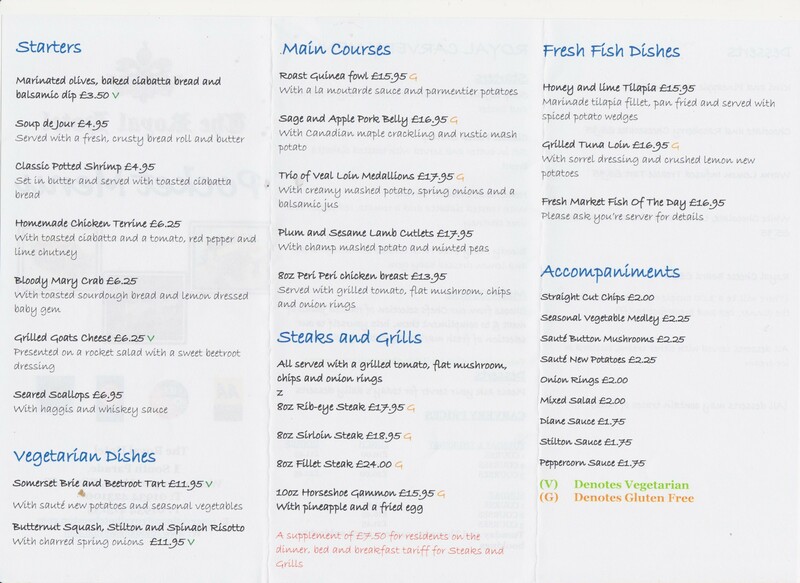 As you can see from the menu this represents good value. Should you wish to have fewer than 3 courses you will be charged the menu prices unless the fixed price is cheaper than your choices. The Hotel has asked that we let them know what our choices are by the 12th. Please let me have your choices asap. I’ll collate them let the Hotel know. You can tell Emma on 01934 423100 yourself if you want to but, please let me know if you do. I have therefore left it out of the programme. Helicopter Flights turned out to cost about £45 per person with a minimum booking of 24 persons. The Museum is closed on the Monday but we could have arranged a timed visit at £10 per head but again the was a minimum requirement of 24. The Museum is open on the Sunday but it is hosting an event. Individuals can still visit if they want to and pay the event price which I believe is £10. I have therefore left both the Museum Visit and Helicopter Flight out of the programme. Gerry is finding out the bus time but it looks, from their website that there is a regular service. I have included an Open-Top us ride in the programme for Tuesday morning after breakfast. I’ll let you have a firm time when I have the details. Members arrive at their leisure and free to do what they wish. Open-Top Bus Ride after breakfast (time to be arranged). 2 p.m. Aperitif Bar available for setting-up Archives and Memorabilia. 3 p.m. to 5 p.m. Meet and Greet in the Aperitif Bar. 7.30 p.m. Dinner in a reserved area in the Hotel Dining Room. Ad hoc group visit to Locking Parklands for anyone who is interested. a. Stan, Bryan, Mike S, please confirm your room booking. b. Gerry please confirm that I can cancel your reserved room. c. Make your dinner choices from the menu (not including the Carvery) and let me know asap but in any event before 12 Sep 16.
d. Obtain a Parking Permit from Reception if you arrive before 3 p.m. I think that covers everything. I’m really looking forward to the Reunion and to seeing you all again. PS It’s not too late for anyone else to join in and come to our Reunion to celebrate the start of our Apprenticeship. This is probably our last major reunion due to our advancing years and our various ‘infirmities’ so why not come along for old times’ sake.